June 24, 2012 By Katie P.
I love statistics and all the fun charts and graphs you can make. I also love TED Talks. You can imagine my delight when watching Hans Rosling’s New Insights on Poverty, when he inserts his grandparents into the data set while comparing past and present economic situations around the world. Genealogy adding context to economic data? Yes please! Here’s how it works. 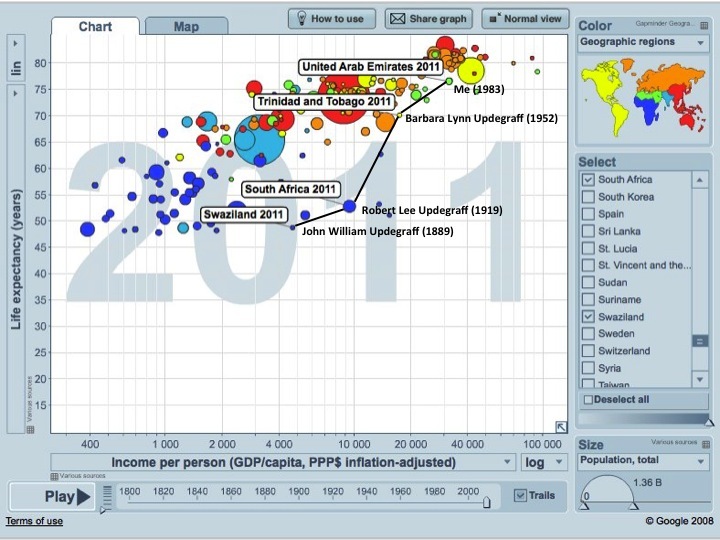 Gapminder has compiled an incredible amount of historical data from around the world on various topics such as life expectancy, education, energy consumption, GDP, population growth, etc. Click here to view a chart of life expectancy and income per person (inflation-adjusted). On this particular chart, the data goes back to the year 1800 and if you click “play,” you’ll see some incredible patterns unfold. Not much happens in the 1800’s, but around 1910 things start to really take off. On the right bar, you can click on a particular country to see their journey to increased life expectancy and income. Inspired by Mr. Rosling’s example, I thought I would give some context to the world my ancestors were born into. My Great Grandfather, John William Updegraff, who was born in 1889 in the United States, was born into similar conditions (life expectancy/income) as present day Swaziland. Using the same reasoning, my Grandfather, Robert Lee Updegraff was born in South Africa and my Mother in Trinidad and Tobago. Myself, born in 1983, similar to present day United Arab Emirates. I would have gone back to my 2nd Great Grandfather Henry Updegraff, who was born in 1855, but there are no present day countries represented in the data with similar life expectancy and income. It’s interesting to note the consistent and significant increase of life expectancy among each generation in the United States. Looking at my Dad’s family, all born in Austria, I ran into a couple issues. In comparing child mortality with income per person (inflation-adjusted), I couldn’t find a similar present day equivalent to the world that my Great Grandfather Kilian Pirolt (1874 Austria) was born into. Furthermore, my Grandfather Johann Pirolt (1906 Austria) and my Father (1944 Austria), were both born into similar conditions; thanks to WW2 there was little improvement among the two generations. 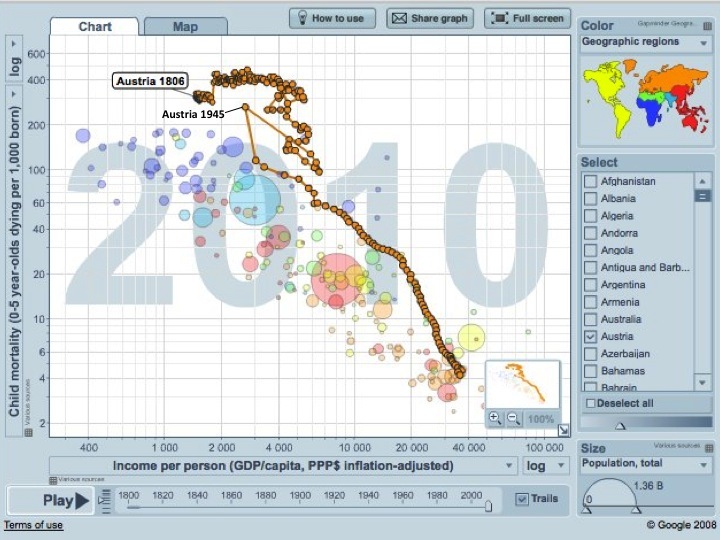 In fact, in 1945, Austria reverted back to the 1860 income rate and 1914 child mortality rate. It took nearly 5 years for them to get back on a consistent track of improvement. I encourage everyone to check out the gapminder website and enter in the countries and dates your ancestors were born. The data will give you a better understanding of the conditions of and improvements made from one generation to the next. Since I haven’t had much time for genealogy lately, I thought I would reblog an old favorite of mine. Enjoy! Hi Katie…..you amaze me!! I wish I had your abilities! I will check out the GAPFINDER as you suggest. I just wish I knew how to pull up some pictures! Is the young girl Margaret the sister of Bessie? And I saw my Uncle Bill Lowery in one of the photos! Great job!